It all started with this blog. Last year a casting producer for House Hunters International contacted me through my About page. If you aren’t familiar with the House Hunters International you are apparently in the minority because I’ve been told it’s one of the most watched shows on cable television. The producer asked if I would be interested in doing an episode about my move to Tanzania and our process for finding a house. (They were interested in featuring someone who worked with animals–I guess owning a safari company qualifies for that.) I initially dismissed the idea because, having not actually seen the show, I assumed that it only featured people living in huge, expensive expat-style houses. But a friend encouraged me to just check it out more. So I replied to the producer, we exchanged a few emails, talked a few times by phone and I filled out a lengthy questionnaire about my move and how we found a house to live in. And then it was time to submit a casting video. We decided to film it while Kakasii and I were on a safari touring several lodges and safari camps to use for our safari clients. Kakasii was such a good sport about the whole thing even though I know he absolutely had no clue what any of this was about. It’s hard to explain American reality TV to a Tanzanian. After several more emails we got the nod from the powers that be at the production company: we were going to be featured on House Hunters International. If you’ve seen the show you know there’s usually a back story that explains where the featured person came from. We were able to film that part of the show while I was back in Baltimore last August for a friend’s wedding. One of the scenes we shot was a “girlfriends’ lunch” with some of the women I used to work with at Lutheran World Relief. For the Tanzania part of our episode, we filmed here for five very long days! But the crew was so great–David, the producer; Mike, the cameraman; and Joe, the sound guy. They were so patient and encouraging through the whole filming, even when the rest of us got really tired. We filmed some safari scenes inside Arusha National Park, with the beautiful Mount Meru as our backdrop. 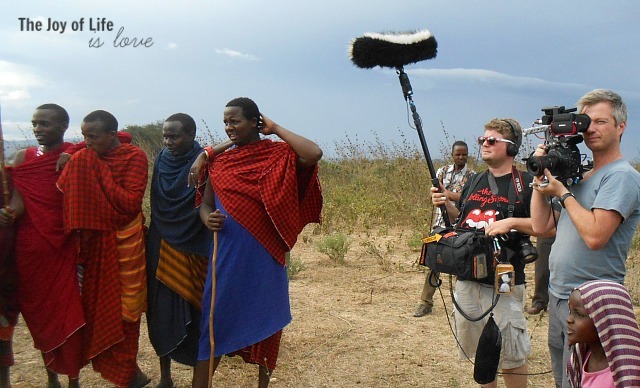 And we filmed at a Maasai village. And we filmed scenes of what life is like in Arusha, including how we buy charcoal for cooking from a Maasai lady that delivers it to our house on the back of a donkey. If you want to see the finished show, our episode of House Hunters International will air on Monday April 13 on HGTV at 10:30 pm Eastern and again at 1:30 am Eastern. The network does sometimes end up changing air dates so you can check here for times. We won’t actually get to see the episode ourselves for three or four weeks after it airs when they send a DVD to us here in Tanzania. So please come back and comment on how it was so we know what to expect! This entry was posted in Family Time, Our Community, Tanzanian Culture, Twin Fun. Bookmark the permalink. Great stuff, Brenda. Karen and I will look forward to watching the program! How exciting! I, too, watch this program and have already set my DVR to record the program just in case I am not home! I will send a follow up message once I have seen the program! so much fun. Easter Blessings! Your turn to be famous, and your sweet little ones will probably be offered a modeling job, not to mention the publicity for your Safari business. WIN, WIN, WIN!!! How wonderful is this? I agree with Jan’s comments about the modeling offers for the twins. So looking forward to watching! Certainly enjoyed the segment on HGTV last night. Makes us feel closer to you now. We had a friend from Tanzania, John MKenda for years. He passed away a couple years ago. Anyway thur him we know a little about your area. He lived at the base of Mt. K. Your family should be very happy in this house. There were many things to take into consideration. How is the business going? We didn’t know that is what your occupation was. Very interesting and so glad you decided to be part of the house hunt. Business is coming along here. We’ve received one inquiry already from someone who saw the show last night and wants to do a safari with us! Thanks for watching the show and for coming back to the blog to share your comments! Brenda, I watched the show last night and thoroughly enjoyed it! I visited Arusha last year in May, the show brought back many wonderful memories. I hope to return to Arusha this October with Operation Bootstrap Africa. Maybe we will have an opportunity to meet. I am hoping to also visit with Dr. Mark and Linda Jacobson, it would be great to visit everyone at the same time. I will keep you posted about the return trip to Arusha. God Bless you and your family. Jeanne, I hope we’ll have a chance to see each other when you’re in Arusha in October. Do you know Jean Wahlstrom from the board of OBA? I first met her and Marvin when I was still working for Lutheran World Relief but we see each other occasionally when they’re back in Tanzania. Thanks for watching the show and coming back to the blog to comment! Brenda, I have not had the opportunity to meet Jean Wahlstrom yet. I support OBA by sponsoring a girl at the MGLSS. I also support the Olarash school. I hope we can meet when I return to Arusha. Again, I really enjoyed the TV show and getting to know you and your husband lthrough the show. While watching the show I knew which house you selected as I recognized the play area for the twins! family. Best Wishes on your business!! Thanks for watching the show Cecil Maureen! Brenda and Kikasaii I saw the show the other night and thoroughly enjoyed it. It is good for others tto see that there are stable countries in Africa that are safe to visit and live in. The programmed showed that the old stereotypes of Africa are just that. It is large continent with many countries and cultures. Your house looks large and comfortable and the opportunity to leave near Mt Kilamanjiro will provide your twins memorize for life. Plus it is a bonus that hey are multilingual! I have a friend that had mentioned she wanted to go on a safari. Do you have a webpage for your company that you could give out? Hi Lisa, thanks for stopping by to comment! I’m glad you enjoyed the show. We had so much fun making it. Tanzania, like any country, has its challenges but it also has so many wonderful things about it too (not the least of which is the views of Mt. Kilimanjaro)! Max and Elly are thriving here and I love seeing them embrace their Tanzanian heritage. And their Swahili is excellent–much better than mine. The name of our company is Tanzania Choice Safaris. You can find us at http://tanzaniachoicesafaris.com/ and on Facebook at https://www.facebook.com/tanzaniachoice. We would love to help your friend plan an incredible Tanzanian safari! I just saw your show. I loved it. Getting to see some part of Africa that was real life was THE BEST. Good luck to you and your family. Very good episode. I enjoyed seeing the beautiful scenery. Glad you saw the show Sharon! It was lots of fun to do!